As we covered previously, when you get custom garage cabinets you are investing in your home and adding value to it. Why can’t you just hire a handyman to install your garage cabinets? 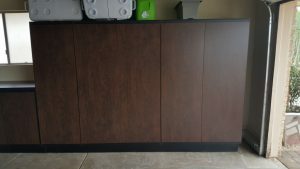 The point here is that if you are investing the money to have melamine storage cabinets installed, then make sure that you have it done right by hiring a qualified professional. How do you choose the right professional to install your melamine garage cabinets? The first step in choosing someone to install your melamine storage cabinets is to make sure that they are qualified to do so. You do this by first ensuring that they are licensed, bonded, and insured. Would it be less expensive to hire a handyman that is not licensed, bonded, and insured? It probably would but will you be sure of the end result? The first step in choosing someone to install your melamine storage cabinets is to make sure that they are qualified to do so. You do this by first ensuring that they are licensed, bonded, and insured. Would it be less expensive to hire a handyman that is not licensed, bonded, and insured? It probably would. Would that handyman do as good of a job as a professional would? He might, but then again he might not. If it turns out that the handyman you hire does shoddy work then you don’t have a lot of options. While there is a registrar of contractors to file a complaint with, that won’t solve your problem in a hurry. There is also a good chance a handyman won’t have insurance to cover any damages he does to your property or injuries he sustains while working in your garage. There is no way to force him to pay for the materials that he has essentially wasted, or get him to give you back the money you spent on labor. In other words, you don’t really have many options that will enable you to find a means of making things right if you hire a handyman that does a poor job. This is why you should only hire a licensed, bonded, and insured professional when you decide to get garage cabinets. After making sure that the professional you are hiring has all of the necessary licensing and insurance, take a little bit of time to research them and see what their prior clients are saying about them. If everything sounds good then you should contact them, then ask them questions to ensure that they have experience installing melamine garage cabinets. Taking the time to do these few things will help to ensure that the money you spend installing melamine storage cabinets will be worth it.